Could be a response to Westjet's new service to LGA airport. Looks like the other airlines are trying to grab some market share. 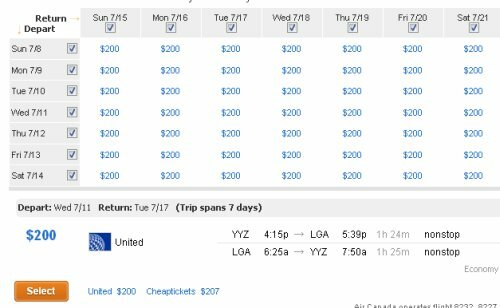 toronto, yyz, flight deals, new york city, new york, united states and lga. 3 Responses to "Looks like every summer flight from Toronto to NYC is at ~$200 roundtrip after taxes"
Amazing! I just booked this deal for Canada day long weekend. Thanks for the heads up Chris! You do great work and I follow your blog religiously! Excellent, glad it helped Melissa! I am planning to fly to NYC on early spring, if this offer is still available by then I will take it. Thanks Chris for this tip.